Oligodendrogliomas are primary brain tumours which means they have originated in the brain instead of spreading from elsewhere. They belong to the group of brain tumours known as gliomas as they develop from a type of glial cell known as an oligodendrocyte. Oligodendrogliomas are the third most common glioma, accounting for 2-5% of all primary brain tumours and 5-18% of gliomas. They are more common in adults, particularly in people aged 40-60. 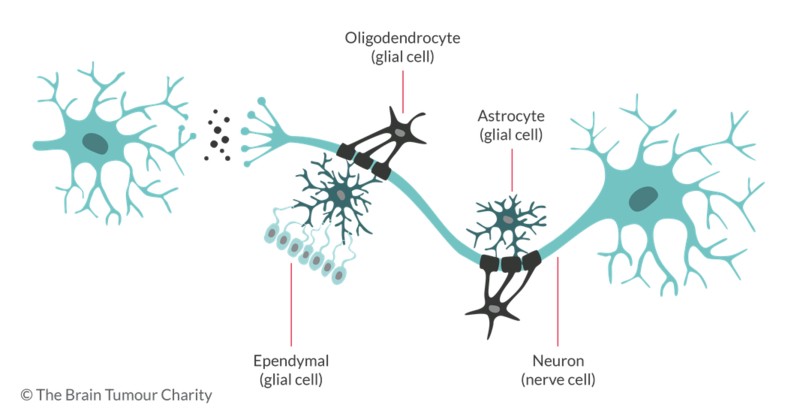 Oligodendrocyte cells produce a fatty, protective covering (called myelin) of the nerve cells in the brain, which helps nerve signals to travel along the nerves more quickly. As with most tumours, the cause is not known. This can be a difficult thing to accept and can leave you feeling helpless, but there is nothing you could have done to prevent this from happening. The Brain Tumour Charity is contributing to the funding of research into a possible cause that is focussed around our genes. What are the symptoms of an oligodendroglioma? Sometimes the symptoms experienced depend on where the brain tumours are located. If they are in the frontal lobe this may cause gradual changes in mood and personality, weakness or numbness in muscles of one side of the body. If it is located in the temporal lobe, this may cause problems with speech and coordination or it may affect memory. What are the types of oligodrendroglioma? The majority of oligodendrogliomas occur in the frontal lobe, and the second most common site affected is the temporal lobe. Grade 3 oligodendrogliomas are more common in older people aged 60-80, but can affect any age. Oligodendrogliomas are slightly more common in men than in women. Occasionally oligodendrogliomas contain clear evidence of different glial cells called astrocytes. These tumours which have a mix of cells may be referred to as 'oligoastrocytomas'. However, this diagnosis is discouraged because genetic testing can now determine whether the tumour should be classified as an astrocytoma or an oligodendroglioma.